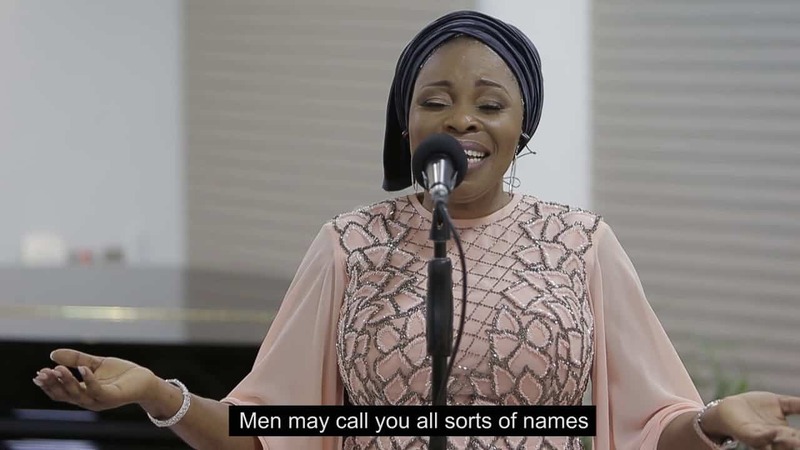 You can find the most accurate lyrics to Tope Alabi’s songs and video on this page. The page is created to show you Tope Alabi Biography, her early life, songwriting career, music, and video lyrics. Tope Alabi, also known as “Ore ti o common” and fondly called “Agbo Jesu”, is a Nigerian gospel singer, film music composer, and actress. She was born on 27 October 1970 in Lagos State, Nigeria, West Africa. She was formerly a member of the Jesters International comedy group and later worked with other famous traveling and stage theater groups in both Ibadan, Lagos, and few other southwestern states. She made films in the Yoruba film genre of Nigeria. Alabi later metamorphosed into gospel music profession after she became a born-again Christian. Tope Alabi studied at Oba Akinyele Memorial High School, Bashorun Anlugbua, Ibadan in the year 1986 where she obtained her West Africa School Certificate (WASC) qualification. She then proceeded to The Polytechnic, Ibadan where she studied Mass Communication and graduated in the year 1990. Compilation of Soundtracks from the Archive of Tope Alabi. She also has some Live Performance Releases from the “Praise the Almighty Concert” organized yearly including “Praise the Almighty Concert Live Video CD” 2014, Praise the Almighty Concert Audio and Video CD 2016 and the live video of the Welcome and Award Event that was titled Amazing Grace. Come along with me as I take you through all the popular songs from Tope Alabi, their videos and full lyrics. baba ologo julo to da ohun gbogbo pelu ogo. aye mi n wari ogo re. olowo ina oooo, iwo nikan logo ye ooo you are worthy. i tremble at your feet(2ce)worthy of our worship. ijoba ni bi gbogbo olori aye isale ile alainipekun ni o. Who can call you by all your names? The powerful shadow that turns away the day of the death. The door! The key! The inner chamber! You are the access! How can you be measured? The mighty puzzle, who can unravel you? nobody like my Jesus, nobody like my saviour!